We said good bye to our new friend Pollo and left the LaPosta around noon. It was boiling hot and the road to Buenos Aires was somehow unremarkable. This would be the last part of our incredible trip. Sadness slowly crawled upon us. With the carneval going on the roads were surprisingly empty. Later we learned that the whole city goes to the beaches during these few days. That made the ride into Buenos Aires real simple and easy. We found a hostel very close to the centre of town. We had a nice welcome from the great crew of the hostel and parked the bikes securely in the garden of the hostel. The next day we went to DakarMotors who are very well organized in shipping the bikes. We spend an afternoon talking with Javier and Sandra and they gave us all the necessary information. All we had to do is to bring the bikes to the airport and pay the shipment the day after. The payment turned out to be a little bit a hassle. Due to the crisis in Argentina all major payments have to be made in cash. Problem is: you only get the maximum amount of 1500Ps (around 150€) at a time out of a ATM. So the next few days we ran around town to get the money for shipping the bikes. Since we had to pay around 20000Ps per bike we ended up with a whole backpack full of 100ps bills…. I never felt that rich! In between we enjoyed Buenos Aires, good steaks, rode around the city on rented bicycles and did some sightseeing. We enjoyed the last few days, even though our hostel wasn’t that good after all. The rotten smell in the bathroom didn’t hide long, but all the animals we shared our bedroom with only showed up one after one. At least the cockroaches seemed to have a sense of cleanliness. They took a bath in our shampoo..
After we have sent our motorbikes we switched to another hostel which was just on the other side of the road. Clean beds and airconditioned room made the last 2 nights a lot more comfortable. Our great adventure has finally come to an end. It was fantastic and we are so glad that we did this. Buenos Aires was quite empty during carnival… we enjoyed empty streets. We renter some bikes to fly through the city. A great way to explore a city. Paying the shipment of the bikes… we were glad after we got rid of all the cash …. The following day was offering a great surprise as we expected a little bit boring riding. Instead we followed the Rio Limay north in an amazing valley. Rocky needles and walls on both sides of the valley accompany a green winding river. The road is in good condition and so riding is a blast. When we stopped for gas the whole valley was covered in dust. The fine dust was everywhere in the air. A small and dusty dry riverbed crosses the valley of Rio Limay and the strong wind blows up the particles in the air and into the valley. We followed the cloud of dust for many kilometers until the valley opened up and formed a huge lake. The landscape became less and less hilly until it became what we expected: vast, flat, boring. We stopped in little roadside hotels in little towns with nothing to offer. Except one thing: it is Argentina here! So we enjoyed the great steaks for dinner. We past an area where they produce a lot of fruits. On both sides of the road endless fields of apple trees. Heavy trucks transport the fruits on the road. The heavy load is often secured very poorly on the trucks, so we keep our distance when we pass them. On one of the stops we meet Karl from Türkenfeld, not 30km from Munich. He is a great guy travelling the world without speaking anything else than Bavarian. We shared a coffee and had a great chat with him. He had quite some stories to tell. The more east we got the dryer and vast the countryside became. We stopped 2 more times before we reached Azul a little boring town with nothing to see, except La Posta and Jorge. But that is something for the next blog entry…. The Rio Limay has cut a fantastic valley into the mountains here. Christy is still using here crutches to get around. Great rock needles on both sides of the road. We didn’t expect this at all and we were happy that we turned around the day before. We would have bypassed this road. Strong wind blew the fine dust into the air. We followed the dust for many kilometres. Strong winds and the heat created many of these little wind funnels. Little traffic and a joyful day on the bikes. Break in a field of fruits. This road went straight for 130km! No change all day long. Vast and flat. Karl, a great guy with loads of stories. We already look forward to meet him in Munich. We are back on the bikes! Finally! It is fantastic! 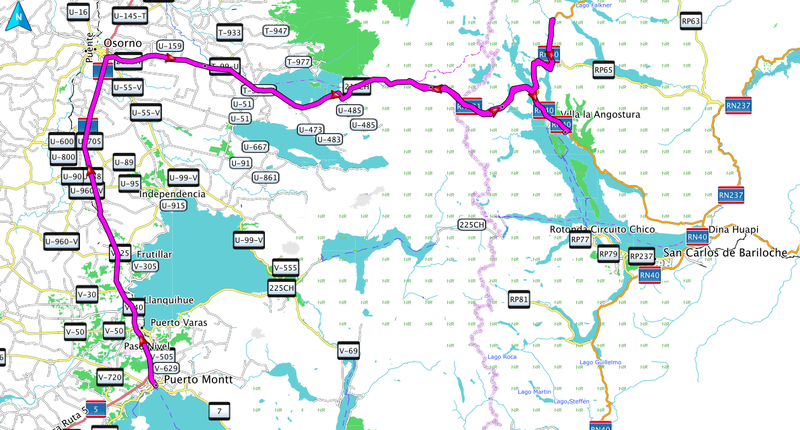 On a sunny day we leave Puerto Montt and ride the road back to the region of the seven lakes north of Bariloche in Argentina. Christy is doing fine, but every time we stop we get funny looks from people. It is quite an unusual sight when Christy is taking her crutches off the bike and wobbling around on them in her biker dress. We take it easy and stop for the night in a small roadside hotel. I will remember that place very well for the low door on which I bumped my head almost every time I passed it. Even though I got reminded of the low door with a quite painful event every time I just didn’t seem to learn it. It was great fun to put on the helmet the next day. The boarder crossing to Argentina was quite busy but at least here Christy’s misfortune was good for something: we could pass the long line to get upfront so the crossing was done in no time. We have seen it a couple of times on border crossings, that in between the Chilean and Argentinian customs there is quite some distance. But nothing like here. 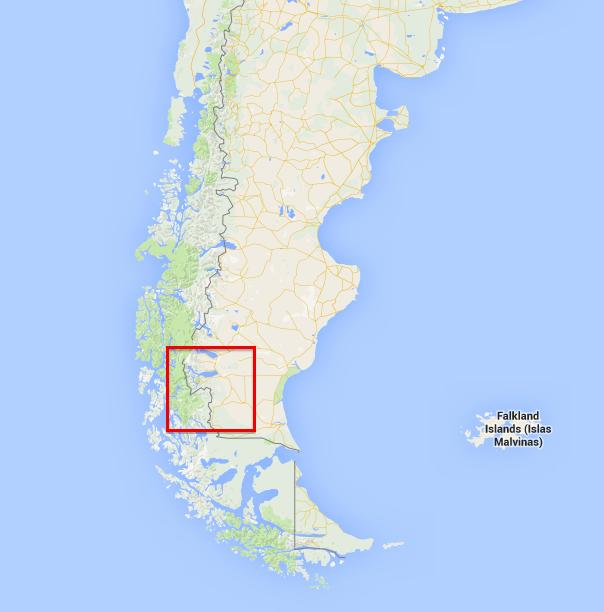 It is more than 30km from leaving Chile to entering Argentina. Till here it was a pretty cold and cloudy day. But the Argentinian side welcomed us with nice and warm weather. 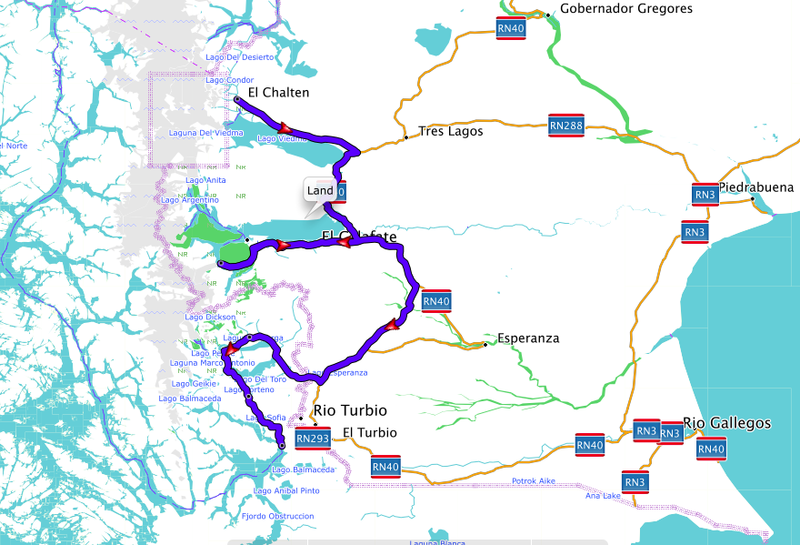 We went 40km into the area of 7 lagos on the road to San Martin. The area reminded me a lot of the Black Forest, my home in Germany. There are many huge lakes and the road winds through them beautifully and making it a great day on the motorbike. A short gravel part stopped us (we didn’t want to risk too much gravel since for Christy’s foot it was still painful to get vibrations on the bike). So we turned back to Villa la Angostura. We found a nice campsite and had a relaxing evening with other local bikers. Christy is checking the bike. We lowered it a bit so she would be able to reach the ground better with her foot. Long lines at the border. We put up our camping chairs to make a little break. The national park of Puyehue is very nice with a great road. The clouds were low that day and it was cold. Fantastic contrasts with the green forest. Going down on the Argentinian side it got noticeable warmer. The region of the seven lakes indeed has lakes. Riding was fantastic: good roads, little traffic, nice surroundings. Great views. This area is very famous for local tourism as well. There is even a ski area in winter. Making a little break. The chairs we bought are really great for Christy. So she can rest her foot. Christy wobbling back to the bike. Since Christy is getting better we can even go camping. After we gave back our truck we stayed in a hostel for a week. It was very nice with a great view on the harbor of Puerto Montt where huge cruise ships anchored and big birds flew by our window every day. Christy was getting better every day, but the doctor we visited here said she should rest another week before we can get back on the bikes. After a few days I got bored and I decided to take the bike for a little spin on the Island of Chiloe. So I packed some things together and rode on south to the short ferry crossing that would take me to Chiloe. It was great to be back on the bike again. After the short ferry crossing I took the road to Ancud and further to a penguin colony. The ride was fantastic. A curvy road, the sun shining, little traffic and finally the rocky coast of the island. The road ended in a beach from where little boats take the tourists very close to the penguins. I decided not to join them and instead enjoyed the fantastic beach that ended on both sides in huge rock formations. In kept going south and rode great gravel roads through forests and farming areas. All very nice and enjoyable. When I finally ended up in the little town of Castro I had a day full of great riding and I enjoyed a beer with some life music that was played in front of the colorful church of the town. The next day I headed southwest to Culcao and Quilan. The road got a bit sandy and I enjoyed playing with the bike in the sandy bits. It was never difficult there though. The road ends at a parking spot from where you could hike 45 minutes to an outlook. The guard at the parking told me I may go there by bike that I intended to do immediately. The track was wide in the beginning and easy, but soon it turned into a very steep narrow track with big steps. It was great fun to ride it, but it would be unnerving if I met hikers on this track. There was no way to bypass hikers. So after a while I turned around and rode the steep track down again. The landscape was incredible. The steaming and roaring sea covered the coast in a mist of salty water. Steep cliffs and flat sand beaches formed the coast. Riding was a blast and so I returned back to the north with a big smile on my face. Short stops at some of the beautiful wooden churches contributed to these great days I had on that island. It is really great motorbike country here. We relaxed in a note with a great view on the harbour of Puerto Montt. We were really lazy. We had to kill a week before Christy could go back on the road. The ferry crossing to Chiloe is short, but lots of birds, sea lions and even penguins follow the ferry. A nice beach. Nearby are little islands with a penguin colony. The inland of the islands has many kilometres of nice gravel roads. Many old wooden churches are the main attractions of the island. Castro has some nice houses and is a little clam town. On the road to Cucao. A gravel road led to Quilao, a nice lookout. Partly sandy roads allowed me to play around with the bike… Yipiiieeehhh. It was great to be back on the bike. We had arranged to bring the pick-up back to Puerto Montt. 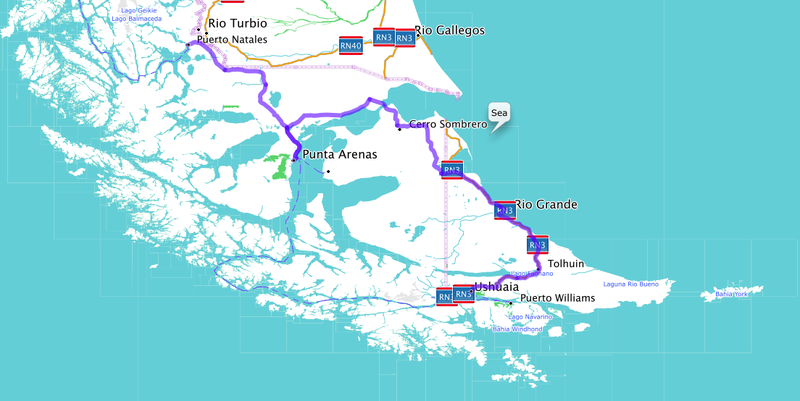 From there the roads to Buenos Aires are all paved and we hopefully wouldn’t hit strong winds. With Christy still hobbling around with here crutches we didn’t want to risk her not feeling safe on the motorbike. We had to cover 2300km. It was mainly flat and vast country we drove through. Unusual for this area we had very little wind. And so it was a very relaxing driving. Little traffic, straight roads, no wind, nothing to destract you from driving. For some time even Christy took over, driving with cruise control. For me it was a nice break and I enjoyed not having to concentrate on the boring road. But the landscape had its elements. The incredible vastness is something that just makes you dream and take it easy. It is like a visual relaxation program. The last few hundred kilometers became actually really nice. The area gets hillier, and finally the hills become mountains. We didn’t stop in Bariloche but continued to a hotel next to one of the lakes in the Argentinian Lake District. A very beautiful area with dark forests and lots of lakes. The ferry to leave Tierra del Fuego. but mainly it was straights. Beautiful colours from the setting sun. Long roads. This is close to where Christy had her accident. We bypassed Rio Mayo this time though. Along the roads there are always these little temples, where people donate their best (cokes, booze, cigarettes) in change for a safe travel. Short dusty parts.. somehow I will miss this. The Ruta 40 is still very straight, but the upcoming mountains on the horizon promise some curves. A little break. South of Bariloche the hills slowly became mountains. The birds here are fantastic to watch. How they sail in the wind…. This little fellow is not only an artist in the air, he is proudly demonstrating his military marching style. Even though penguins are are to be found many thousands kilometers north as well, the proximity to Antarctica is making Ushuaia one of the best places to see penguins. So we book a tour on a boat to see these wonderful animals. It was a fantastic day. Lots of animals, not just penguins on a relaxing boat trip. We were really enjoying this a lot. There are many little islands on the Beagle Channel. This one is having a little swim. aaand here they are! There is a king penguin as well… go find him…! 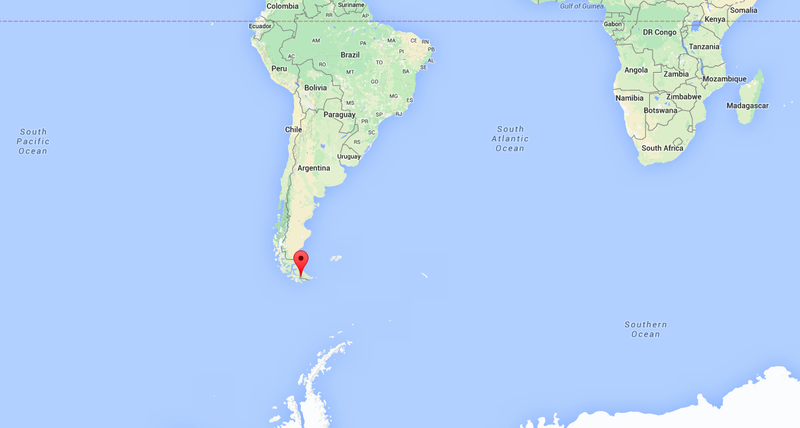 When approaching the southernmost point of America you have to cross the border of Argentina. 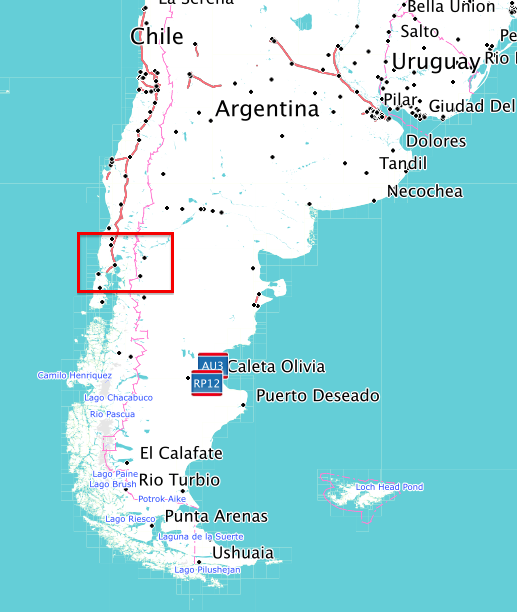 Even though the southernmost point of America is in Chile, the southernmost on-land accessible city is Ushuaia in Argentina, which again is only accessible in a car via Chile. It is a result of the boundary treaty of 1881, when the two countries defined their border in only 7 articles. 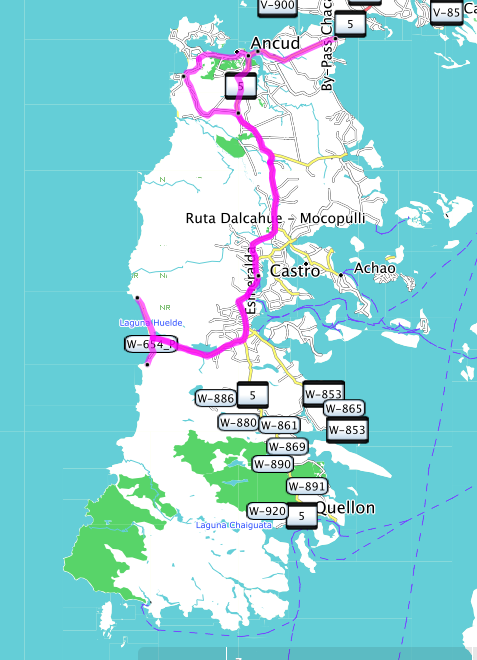 The ride from Puerto Natales to Punta Arenas was kind of unremarkable. The only interesting thing is the vastness. It is flat and the flora is very reduced. This open land is dong something with your mind. Every time we stop I get on the road and look in both directions. These long lines of the road going all the way to the horizon make you wanting to follow these lines. They pull your mind away. It is quite an experience. The wind is very strong. The few bushes that are growing here are forced to grow into the direction the wind pushes them to. There is a penguin colony with king penguins on the way. But after we have approached the entrance we realize that the wind is too strong for Christy. It is impossible to walk on crutches in this wind. The road continues a little bit further on into a little national park. This is where the network of streets of South America ends. You can not get further south on a motorbike. But you don’t really understand where you are until you have a look at a world map… That is what really blew our mind. On the ferry to Tierra del Fuego. As it goes closer to the Ushuaia it gets a little bit more hilly. And trees reappear…. Perito Moreno is one of the main attractions in Patagonia and so there are loads of people visiting it. We had Christys foot re-checked with a doctor in the morning and so we arrived at the glacier in the late afternoon. That turned out to be great because most visitors and all the organized bus tours had already left. So it was a very nice afternoon. You get very close to the glacier on solid ground here, since it does calve into a lake, but its tip hits a little peninsula where a walkway brings you as close as 100m to the glacier. We continued to follow the Ruta 40 down to the National Park Torres del Paine. The road is nice but very repetitive and we has lots of wind. We were truly happy not to be on a motorbike. You really have to say, that even though we see more motorbikes than ever on this trip, this area is not a great place for motor biking. Too boring, too windy and therefore too dangerous. It got dark and so we started looking for accommodation for the night, still outside the national park Torres del Paine. We saw a sign of a hotel and followed a gravel road to get to it. The road looked real nice and the hotel was nicely integrated into the natural contours of the area. It looked pricy. But we didn’t care. We were tired, we knew the Torres del Paine is expensive so we didn’t care for the costs, it is only one night! Well, I changed my mind when they actually told me the price: 487US$. That really is out of our budget. They were very friendly though and called different other places and finally found something just a little bit outside our budget: 175$, but that would be in a dorm with shared bathroom. WHAT???? That is CRAZY! We thanked, continued and finally found a simple room for 50$ just before the entrance to the park. That’s where we met John. He is a retired UK soldier and travels already since 6 years on his motorbike. He is a great guy. We had a beer in the evening, had a great and fun talk and went off to bed quite late. The next day we drove through the national park. There are tons of people at every bus stop and you just need to have a look at the amount of backpacks here to know the trails are packed. No need to do this…. Instead we stayed on the road that offers great views on the mountains. Again I am experiencing the feeling that “supersights” like the Torres del Paine almost always disappoint me a little bit. Too many people and high expectations just lower the effect that the impression could have if it was a little bit less known and visited. That means for me simply that the most beautiful places usually are not the most known ones. Still, Perito Moreno and Torres del Paine are quite neat places and we did enjoy the views on these wonders of Mother Nature. Again and again there are lakes and rivers of stunning colours creating a strong contrast to the brown and dry surrounding. The landscape is pretty repetitive, but nice. As we approach El Calafate the snowy mountain peaks become visible. The sky offers great cloud and light arrangements. This glacier is formed in the huge southern patagonian ice field, calving into a lake. You can get very close to the glacier since its front hits a peninsula. There are ramps to approach the glacier. e were here late afternoon, when most people have left. The hundreds of oncoming cars and busses gave us an idea how crowded it must be earlier in the day. The ramps were pretty uncomfortable to walk with crutches, so we organised a wheelchair for Christy. Great contrasts: green bushes and blue ice right next to each other. Huge towers are moved constantly up to 3cm per day. On the way south to Torres del Paine again we had great clouds. We met John on our hostel. Great guy and on an ultimate motorbike trip (so far 6 years and no end in sight). Mountains towering over the sea…. These mountains are truly majestic. Huge granite towers. And we are so incredible lucky to see them in all their beauty.The sky is blue, only very few clouds and we see the whole range standing right in front of us. When we arrived here in El Chalten it was cloudy. We didn’t see any of the mountains. But we saw a lot of other travellers. The amounts of huge backpacks that are carried through the streets of the little town almost shocked us. We haven’t seen that many foreign travellers anywhere on our 5 months of South America. We checked into a nice hotel where Christy could at least enjoy a great view while I would go hiking for a day. The next day I started my little hiking tour up to a nice lake. There where many people on the trail and even though the views were fantastic there were just too many people for me to fully enjoy the walk. So I decided to take a less frequented walk that connects two valleys and turned off the main track. It turned out to be a great decision: a great path and a lot less people. In fact I didn’t meet anybody for almost an hour. The narrow path led through thick bushes and grotesque trees. Some parts of the forest could be part of a Harry Potter movie plot. It was quite, just some birds sang their song and the wind stirred up the leaves in the trees and bushes. Just when I was taking some nice pictures of a beautiful red headed wood pecker two hikers came around the corner. I could tell by their accent they were from Nuremberg where I studied for a long time. As it turned out we have friends in common and so they updated me on the news of an old friends of mine. What a coincidence and pleasant surprise. Unfortunately there were still clouds so that I did not have a full view on the main attractions here: the Fitz Roy and the Cerro Torre. But the walk was still very beautiful. The next day the sky was clear. We had a great view on the mountains surrounding us. The two massive granite towers said farewell to us presenting themselves in a picture book panorama. The landscape is nice, but very repetitive on the way south. We met these two guys: dutch travellers on Honda 250s. At a gas station Christy had another motorbike traveller having a look at here x rays: the guy was a doctor. The wind on the Ruta 40 was a killer. We were really glad not to be on a motorbike. Closer to El Chalten the landscape became more beautiful. Great mountains with a little bit of fresh snow. We checked in a nice hotel. Thats the view we had… not bad, eh? The clouds were lifting a little bit. These mountains look cold. And they are. … and his lovely wife. The next day: dark blue sky. Still some clouds in some corners..
Now THATS a mountain! The Fitz Roy! The incredible granite tower of Cerro Torre. Our farewell present from the National Park: what a panorama. A last view on these incredible mountain range. After one hour we reached a canyon with a green river bed. It was a short but difficult hike to the cave of the hands. The wind was incredible strong. The hands are in different colours, and most of them are left hands. From the cave there are great views into the canyon. Massive walls on both sides of the canyon. A hunting scene. The structure of the rock might be the structure of the canyon. Maybe a instruction of the hunting technique? Different figures. Painted some 10.000 years ago. Really impressive. The walkway is nice, but the wind is very strong and makes walking difficult, especially with a broken leg. That little friend was sitting on a rock and enjoyed the sun. It is a Viscacha. 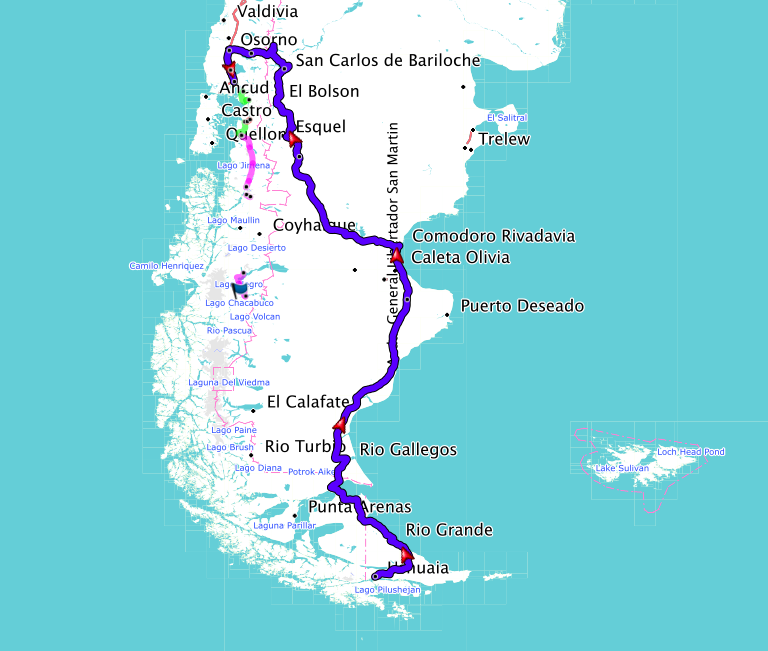 Back on the Ruta 40 we go south again, direction El Chalten to the next highlight…. Maybe that is what the basic message of these hands is. And if so, the message has been delivered. Some 10.000 years later. Nobody really knows the real reason for these paintings, but it is quite impressing to see those old drawings, knowing their age. Getting here was quite a hazzle. The wind is incredibly strong and so Christy is fighting here way down some steep stairs and along a narrow path to get to the caves. I stayed behind her, holding her on her jacket in case the wind would blew her over. The drawings are not really in a cave it is more underneath huge overhangs. They are at the side of a canyon with a river, which enables trees and bushes to grow at the bottom of the canyon. The place is located in the middle of the desert. Most drawings here are hands, but there are also Guanocos, abstract geometrical figures and other animals. At one point there is a hunting scene, using the 3 dimensions of the rock to create a description of how they were hunting animals. Knowing that somebody drew these things so long ago is stunning and magic.